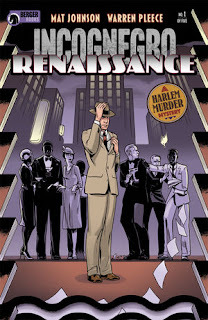 The Fellowship was fortunate enough to obtain a copy of INCOGNEGRO: RENAISSANCE #1 from Berger Books and Dark Horse Comics. Mat Johnson writes, Warren Pleece draws, and Clem Robins letters. Zane is a reporter for the New Holland Herald, but only barely due to his social status. A friend hustled an invite to a book launch in Harlem (that being a bit of a trend in current times). People talk, accusations are hinted at, and then Xavier, the life of the party, turns up dead in an upstairs bathtub. The cops are more interested in covering it up than investigating, so it’s up to Zane to get to the bottom of it. One of the key elements of this story is appropriation and how it can work (or not work) both ways. Zane is hesitant to pose as white to get information, but the writer had no problem with stealing a story from a black guy. And there’s also a murder mystery in this story, so the layers just keep adding on. And the art is a beautifully shaded black & white with a great eye toward the style of the era. This story is a prequel to the well-received graphic novel, also now out in a 10th anniversary printing. Both stories are important as well as entertaining, so check them both out. INCOGNEGRO: RENAISSANCE #1 is available now from your local comic shop, or online at darkhorse.com.